I was so totally thrilled to participate in my first open. I’ve done a good sampling of competition-y activities in my life from karate tournaments, dance competitions, and triathlons. This was a whole different category of competition, since there is no real preparation or dress rehearsal. Every workout is completely different, so there’s no real run-through. You just show up and see what happens. Men lunge = 45 lb. 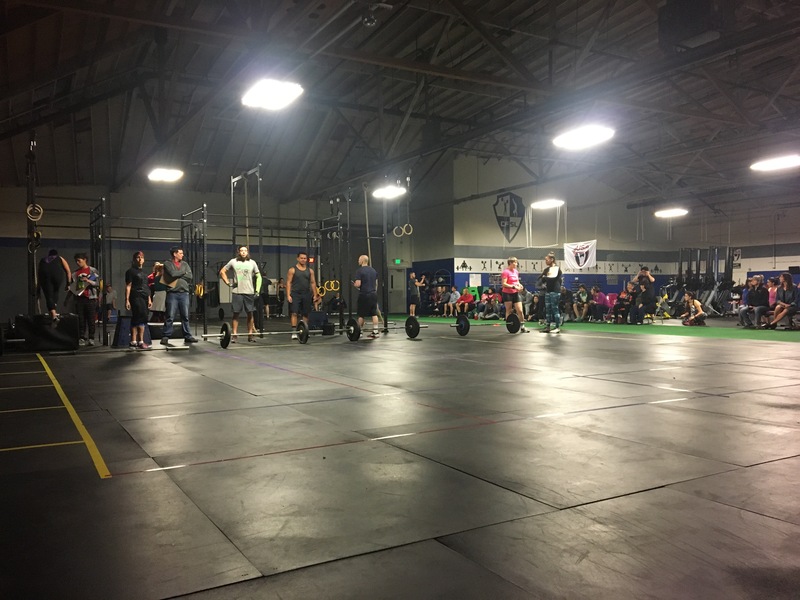 There are about 35 people from my gym participating, so they split us all up into three heats. I was rather nervous before my heat. I always get the jitters before I have to perform or compete. We were given five minutes between heats to set up, and since I didn’t know to measure what size box I’ll need for the pull-ups I was scrambling to the last few seconds to set up. But the adrenaline rush trying to not be late for the starting buzzer was sort of helpful in getting me to forget my nerves and focus. 20 minutes is a REALLY long workout. I started out pacing myself pretty good. And it helped that my judge was incredible. She cheered me on, helped me pace, and let me know when I was coming close to a no-rep. As the clock was narrowing down, the family and friends spectating were cheering louder and louder, giving me the cue to stop pacing and just let it rip for the last few minutes. On my last pass with the lunges, my legs just gave out and I thought I couldn’t stand up again. I was 4 pullups shy of 7 rounds, and even though I had nothing left I was slightly disappointed, lol. Kudos on your Rx! !